The Big Bang Theory‘s 200th episode airs Thursday, February 25, 2016. The City of Pasadena, the setting of the show, has declared that day to be The Big Bang Theory Day, within the city limits. Check out the mayoral proclamation, below. 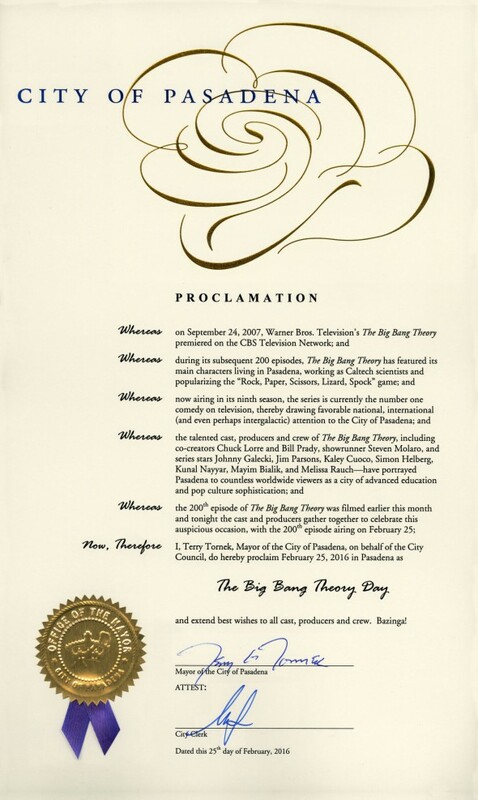 Burbank, CA – February 20, 2016 – To celebrate the milestone of reaching 200 episodes, the City of Pasadena has declared that Thursday, February 25 will officially be proclaimed The Big Bang Theory Day, within Pasadena city limits. The hit comedy series has been fictionally set in the Southern California city for its entire nine-season run. What do you think? The cast of The Big Bang Theory TV show have renewed their contracts through the tenth season. Should the show be cancelled after that? How long do you think it should last? The show is great! I even enjoy reruns I’ve seen repeatedly. I do think the Sheldon character is becoming more enjoyable as a mature & smart man, rather than always silly. Some quirks should remain, of course. I do think the young blonde actress who played the new screenwriter a couple of episodes ago, would add a spark to the dynamics of the group – as Raj’s new girlfriend. Thanks for reading and for your comments, Liza. 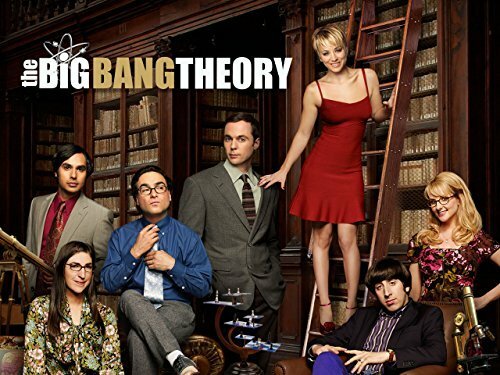 How long do you think The Big Bang TV series can last? 5 more seasons atleast 🙂 Such a wonderful show. i think it can last as long as the cast is willing to stay with it, & as long as the writers can come up with stories relevant to age changes..can still be funny. Again, I do think that new blonde actress, (Raj & Howard met in the comic book store), can add the sassy spark Penny used to have. Nothing against the Penny character, just an addition…as Raj’s new girlfriend…she’s different & smart & can probably fit into the group…with new story lines. Love this show, too. But I think you’re right, Penny used to have more personality than she does now… And she could use a better hair dresser, too. She’s no longer the adorable sweet cutie she was in seasons past. Another problem for me is understanding the awful voice of Bernadette… her voice is soooo annoying!